I was asked by locals to write a series that took place in the surrounding Indianapolis area. Since I volunteer at the animal shelter, it is no surprise it included a rescue dog. 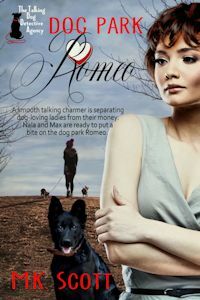 This particular book deals with dog parks where a lot of dog lovers strike up friendships. Unfortunately, there are some scammers at the parks, too. It wasn't one thing. The millennial characters I took some traits from my daughter and stepdaughter's friends and applied them to the younger characters. The older characters have been squatting in my head for a while waiting to show up in a book. “Yeah, what’s up with that?” asked the dog in question. Max, the handsome, black shepherd mix could speak, but would not bark on command for some reason. Instead, he chatted in English, courtesy of a disgruntled girlfriend—who happened to be a witch—of his first owner. Despite all the movies and children’s books about talking dogs, most people weren’t cool about it. “Not now, Max. We’re talking about Harry,” Nala reminded both her dog and her best friend. The exiting diners murmured among themselves, probably commenting on the deep voice that either she or Karly had. It became apparent—shortly after she rescued Max from the dog shelter where her best friend worked—that people don’t believe in talking dogs. She’d just come off sounding crazy if she mentioned the subject. It was probably best not to. Many would take advantage of the situation.